Ross & Cromarty Roots | Laide Burial Ground. 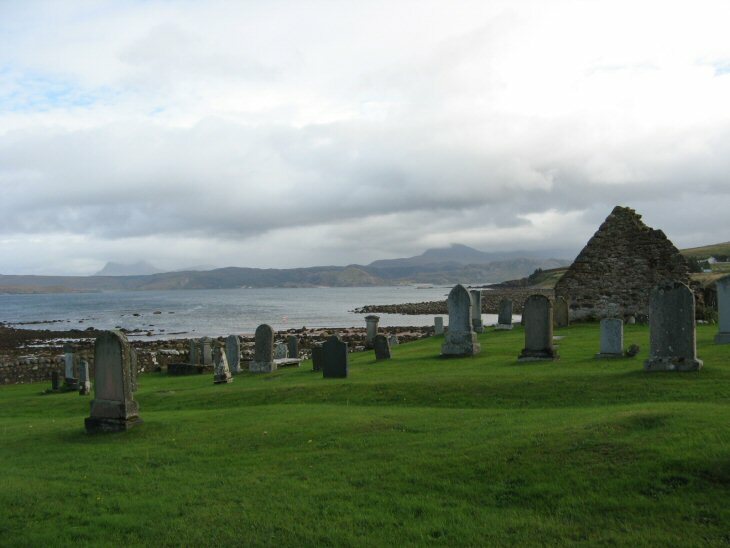 Situated overlooking Gruinard Bay, the Laide Burial Ground includes the remains of the Chapel of Sand of Udrigil. It is believed that this is the site of one of the earliest churches on the west coast of Scotland, possibly attributable to St. Donan. Picture Added on 28 September 2008. Are inscriptions available for this cemetery. Looking for William or Ann Mckenzie/Mackenzie. William born in 1811 or so in Sand and Ann 1821 or so in Laide. Last mention found on 1861 Census in Sand. I have corrected my email address. Added by Scott Forsyth on 26 August 2012. Yes. Use the Advanced Search facility. Image 6720 looks like their headstone. Added by Roddie Macpherson on 26 August 2012. Looking for a grave of Alexander McLeod or MacLeod drowned at Kyle 1899. Added by Dougie on 03 August 2017. Is he likely to have an association with this burial ground, Dougie? Added by Roddie Macpherson on 05 August 2017. We understand he was interred there after his death at Kyle in 1899. Alexander's family were known in the Loch Broom Area back then. Added by Dougie on 05 August 2017. Further to the comments from Dougie on the 5 th August regarding Alexander McLeod I have a card issued by his widow which reads; In memory of beloved husband ......Interred in Laide Churchyard, Ross-shire. Dated 1899. Would there be any church records ? Where might I start research? Alexander Mc Leod was my great grandfather. Thank you. Added by Ann Kinchington on 13 August 2017. Hello Ann. www.scotlandspeople.gov.uk would have his death record. I'm not sure whether Highland Council would have lair information from that time but you could try contacting their offices in Portree. Possible that there was no stone, or, less likely, that it has been lost eg. gone under turf. You could also try the Highland Family History Society to see whether anyone has done another survey of Laide. Added by Roddie Macpherson on 14 August 2017. Ann, I shouldn't have mentioned Portree (Skye was on my mind). I'm not sure which Council office deals with Laide as they keep closing local offices...best email an enquiry to the Highland Council's general contact address. Added by Roddie Macpherson on 15 August 2017. Added by on 18 August 2017.